Hundred-year-old cookbooks often included advertisements at the back of the book, which helped defray the costs of printing the book. 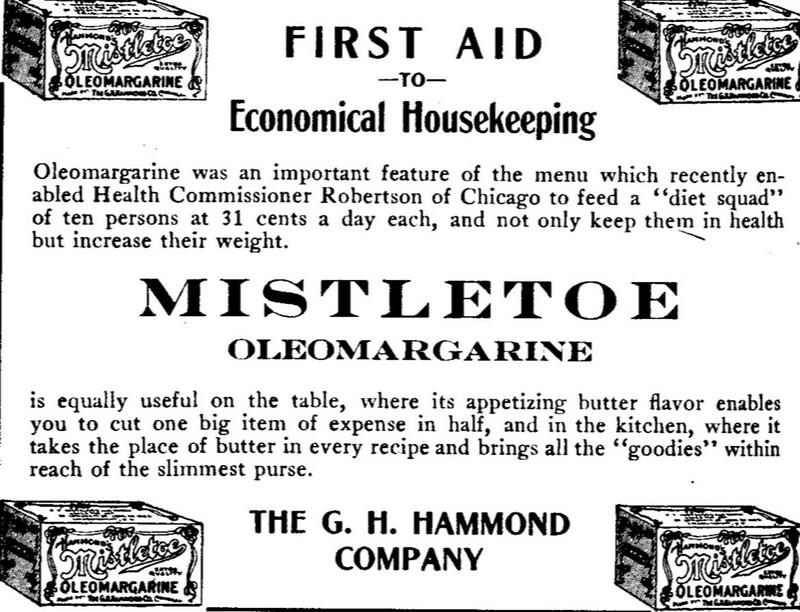 Here’s a 1917 cookbook advertisement for oleomargarine. (Yes, they had margarine back than – though they called it by a longer name.). It appeared in The Housewife’s Cook Book (1917) by Lilla Frich. The book was self-published by Ms. Frich. (Is Ms. the right title to use when writing about a woman who wrote more than 50 years before the term was term was commonly used?) She was the Supervisor of Domestic Science for the Minneapolis Public Schools. Even though the book’s title refers to “housewife’s,” I think that the book was written for use in high school domestic science (home ec) classes. I guess the presumption was that students needed to be taught skills in school so that they were prepared for their future careers as homemakers. I think this is the first time I have seen a food product being equated to First Aid! We used to call that class ‘home economics’ and it was for girls only since the boys took ‘shop’. You must be young! Home Economics came after me. We had Domestic Science. And in our first lesson, we were taught how to scrub a deal table. Even in 1958 that seemed a bit old-fashioned. I’m not young – though I went through school a few years after you. When I took home ec, for our first lesson, we made cinnamon toast using the broiler in the oven to make the toast. Regardless of what the course is called, I wonder why we both clearly remember our first class. We also called it home economics when I was in school. Now it has names like family and consumer science. It’s interesting how the name has shifted across the years. Ahhh…the days when we were suppose to gain weight! It doesn’t sound like Ms. Frich was a Southerner, that was a common way to address a woman and still is. I wish they still taught some useful life skills in high school. As it turns out, most people will need to cook and clean at some point in life, not to mention understanding insurance, banking and all those other grown-up skills. Sometimes I’m amazed (in a negative way) how few people seem to know how to cook these days. I have seen many women who are retired that don’t have any idea where to start from scratch with cooking. They have always had the money to shop using prepared packaged foods that was easy to fix. I find it amazing that they don’t know how to make simple things like coleslaw. Now that they don’t have the money to shop like they used to, find themselves facing a long learning curve. I’d find out whether Lilla Frich was married or not, and use the appropriate Miss or Mrs. Using Ms. feels jarring to me in historical contexts – an extraordinarily small but still important bit of historical revisionism. Have you heard of the margarine wars between Iowa and Minnesota? I have a friend who used to be a “margarine runner,” carrying contraband table spread across the border back into Minnesota! I’m guessing that she was not married since she had a career as the Supervisor of the Domestic Science Department in a school district. Back then most women quit working when they married. No, I’ve heard about how margarine was white in some states, and consumers had to stir in yellow dye because state laws didn’t allow this “imitation” product to look like butter, but I’ve never heard of the margarine wars. Somehow it sounds exciting (in a low key kind of way). One of my first kitchen tasks was to knead the yellow “yolk” into our package of margarine. The margarine (always called “oleo”) came in a clear plastic bag, with the “yolk” inside. I’d sit on a little three-legged stool in the kitchen and knead and knead until the color was even. The margarine wars had to do with the dairy industry’s attempt to keep “fake butter” off people’s tables. My family also called margarine oleo when I was a child. Kneading the yellow “yolk” into the oleo sounds like the perfect cooking task for a child. Wow, this is fascinating. I’m amazed that you actually found something that mentions Mistletoe oleomargarine by name. Until I read your comment, I had no clue how long they’ve been making oleomargarine. I was surprised to see a 1917 ad for it–I never would have that that it was already widely available in the 1880s. I was surprised by that, too! Somehow, I had seen it as a 1930s or so invention. Don’t use oleo ,as we prefer butter.. probably because of having made our own butter. The box that they sold the oleo in was pretty though. I also don’t use oleo – and, like you, I prefer butter. That said, when I was a child we always used oleo. That seems very odd to me looking back since I grew up on a dairy farm. Perhaps my mother felt that oleo was tastier . . . or maybe healthier. Sheryl that seems very odd that you would buy oleo when you could have all the free butter you wanted. I remember city people using oleo but we only ever had butter. I personally have never tasted margarine on it’s own so I don’t know how it tastes on it’s own. I am sure I have had recipes cooked with margarine , like at church potlucks. I think in recipes they behave similar, but I’m not positive. I haven’t eaten margarine in a long time, but my memory is that it doesn’t taste as good as butter. Since both my parents are gone, I can’t ask them why they bought oleo instead of making butter. Maybe it had something to do with the amount of time it would have taken to make butter. I remember when we called margarine oleo! I never realized it was part of the name. Oleomargarine is a really long word. It’s interesting how during different time periods different portions of the word were commonly used to describe this spread.